Goooood morning and happy Waitangi Day! Today’s recipe is a perfect one for enjoying with friends around the barbecue on a balmy summer’s evening, and super easy to prepare – bonus points. Juicy, spiced beef patties are slathered in tomato salsa, avo and smoked paprika-spiked mayo then topped with a fresh, crunchy slaw and fragrant coriander…bloody delicious! Clearly this recipe would be perfect for today, but I am sharing it from my first book Coming Unstuck with an eye on the approaching Best Foods National BBQ Day on Sunday 24th February. If you have the book you may have noticed I specifiy Best Foods as the mayo to use in many of my recipes, as it has long been my preferred creamy condiment! There are loads of way to give the luscious mayo a flavour boost – in this case I use sweet smoked paprika for a spicy kick, but often also use a smidgen of crushed garlic, finely grated lemon or lime zest, harissa or finely chopped herbs…a great way to add a bit of somethin’ somethin’ to the weekend barbecue! So what else is news? I had the pleasure of Hoob and Raven to stay the other week, so much fun, as was the 21st birthday we went to…it is always a rollicking good time heading out and about with the lovelies! A few days later and Pog was here (spoilt mama), and we had a grand afternoon fossicking in the second-hand shops in K-Rd followed by a delicious vego dinner at Cocos Cantina. They are all now ensconced back in Wellington, hard at work like the delicious grown-up people that they are. your favourite store-bought salsa to serve, or of course, make your own! Preheat the barbecue and set the oven to grill. In a food processor, whizz onion and 2 tbsp of the mustard with the garlic and black pepper. Add to meat and gently combine to form 6 patties. Make a small thumb print indent in the middle of each patty, put on a baking paper-lined tray and refrigerate until ready to cook. Roughly mash avocado with zest and juice of 1 lime and season with salt and pepper. Toss red cabbage with zest and juice of second lime and orange, and season with salt and pepper. In separate bowls, put avocado, thickly sliced tomatoes, finely sliced red onion, mayonnaise mixed with smoked paprika, red cabbage, coriander and salsa. Brush the hotplate with oil, season the patties with sea salt and cook 5 minutes each side, until no longer pink in the middle. During cooking, brush lightly with remaining mustard mixed with Tabasco sauce. (Check with guests, and omit if they prefer a milder avor.) Lay buns on an oven tray, cut side up. When patties come off the barbecue, divide cheese among bun bases and grill for a minute until the cheese is bubbling and golden. 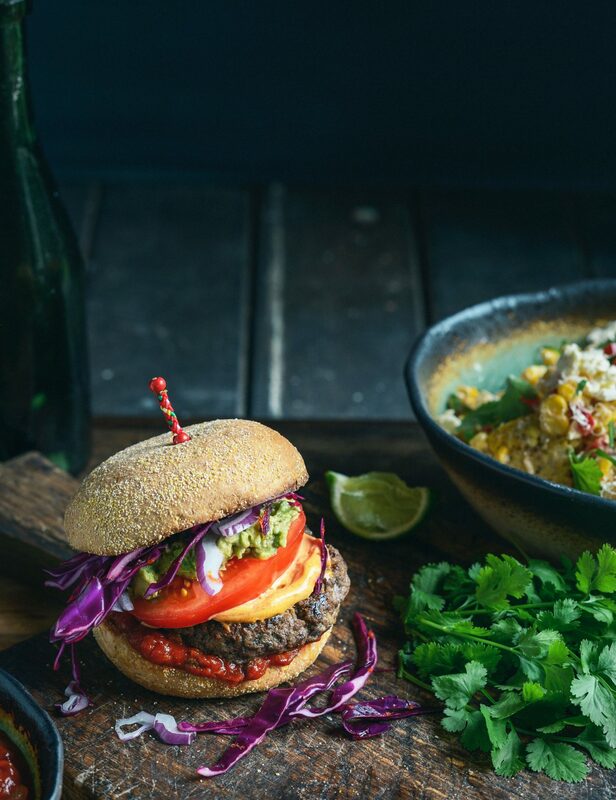 Serve buns and beef patties on a platter and invite guests to layer up their own mega-Mexican-burger, choosing from the selection of toppings.